Plasmas are conductive assemblies of charged particles, neutrals and fields that exhibit collective effects. Further, plasmas carry electrical currents and generate magnetic fields. Plasmas are the most common form of matter, comprising more than 99% of the visible universe, and permeate the solar system, interstellar and intergalactic environments. (1) most plasma systems involve electro-dynamic coupling across micro-, meso- and macroscale and (2) plasma systems occur over most of the physically possible ranges in space, energy and density scales. 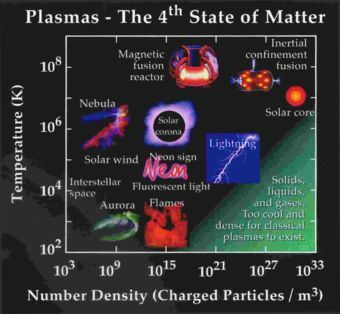 The figure here illustrates where many plasma systems occur in terms of typical densities and temperatures. However, the full range of possible plasma density, energy(temperature) and spatial scales go far beyond this illustration. For example, some space plasmas have been measured to be lower in density than 10 to the power -10 per cubic meter or (10exp-10)/m3 - 13 orders of magnitude less than the scale shown in the figure! On the other extreme, quark-gluon plasmas (although mediated via the strong force field versus the electromagnetic field) are extremely dense nuclear states of matter. For temperature (or energy), some plasma crystal states produced in the laboratory have temperatures close to absolute zero. 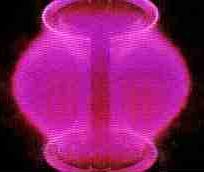 In contrast, space plasmas have been measured with thermal temperatures above 10+9 degrees Kelvin and cosmic rays (a type of plasma with very large gyroradii) are observed at energies well above those produced in any man-made accelerator laboratory. Considering Powers of 10 is useful for grasping the unique way in which plasmas are radically multi-scale in space, energy and density. Coalition for Plasma Science provides a teacher's guide and educational publications. Because plasmas are conductive and respond to electric and magnetic fields and can be efficient sources of radiation, they can be used in innumerable applications where such control is needed or when special sources of energy or radiation are required. The topics page provides close to 200 subject areas in plasma science and technology and nearly 100 applications! Alan Watts of Environmental Surface Technologies in Atlanta, Georgia has suggested the following grid for organizing industrial plasmas with reference to the major "revolutions," energy type and technology. When considered inclusively, it is clear that plasma science and technology encompasses immense diversity, pervasiveness and potential. Diversity through numerous topical areas; pervasiveness by covering the full range of energy, density, time and spatial scales; and potential through innumerable current and future applications. Thus the theme of our exhibition. This primary natural systems table above is a "unit" for purposes of legal permission.